If you are looking for another kind of romance novel and love the touch of mysterious things compared with a great writing style, then this could be worth your time. This book kind of surprised me. It was totally different from every book I knew so far from the author. And yet I found her style and love for a good story on every page. Caleb, Fox and Gage, three boys who have known each other since early childhood, want to celebrate into their tenth birthday. Together they set off, packed with a thirst for adventure. As innocent nine-year-olds, they leave home and return as ten-year-olds, deprived of their childlike innocence. Since that night, Hawkins Hollow breaks hell for seven days every seven years. Nearly twenty-one years have passed since then, and once again The Seven as called by the residents of Hawkins Hollow, are at the door. The tone is more explorative, direct and open. 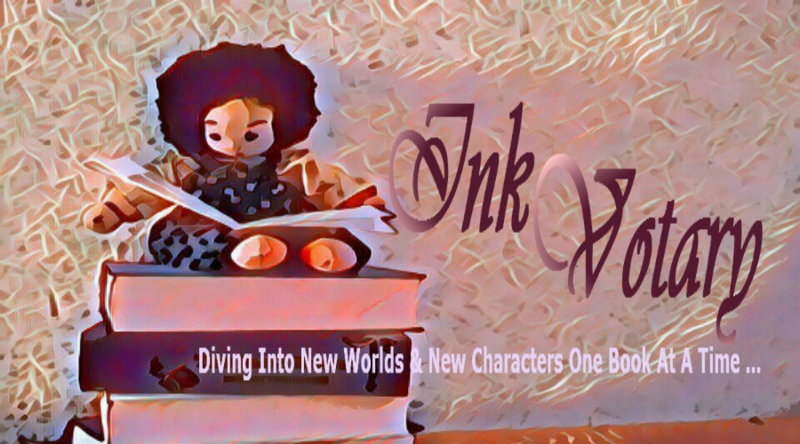 The author goes into the mystical world of demons with the story of Caleb, Fox, and Gage, bringing great feelings, excitement, friendship and the love of the family into the foreground and what a cohesion of several people that connects something, can cause. 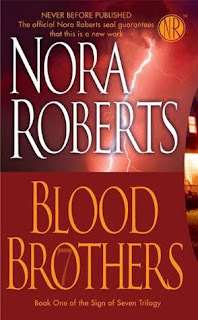 Usually, you don´t bring a dark tone and Nora Roberts together in a book. But with Blood Brothers, you´ll find it fitting. Somehow the author manages it perfectly to keep her other attributes romance, love, and family combined in a well-written manner. And though some absolutely evil things happen, you always know that there will be some sort of happy ending in the end. And that love will win, no matter what or how. Caleb Hawkins is vulnerable as a boy, needs extremely strong glasses and calls two fantastic people his parents. On the night of his tenth birthday, he undergoes a change, and from then on, he does not need any glasses anymore and otherwise he discovers something that is not normal. But with the changes of that night, something else happened. Caleb carries an incredible responsibility on his shoulders from then on. He sees it as his task to stop the events and is portrayed by Nora Roberts as a wonderfully profound, handsome and conscientious man, but still has his longings and dreams, but he hangs back while it is his responsibility to ensure that The Seven in his hometown cause no major damage. Quinn Black is a lot more contradictory. Spirited, no perfect beauty, has a fine overbite, a slightly too full upper lip, too big eyes and yet she is pure fascination. She approaches the mystery of The Seven with a completely different way of looking at things, constantly strives to eat as healthy as possible and low in fat, and once she has fixed herself on a topic, she works and researches until she falls over. She just follows her instincts, has common sense, keeps adding new aspects to the puzzle of Hawkins Hollow and stands fearless and combative on Caleb´s side. This is neither a light romance nor a mystery novel. Completely unlike the other works of the author, this novel clearly bears Nora Roberts handwriting and brings the reader exciting, beautiful and sometimes captivating moments. Just right for those who like a mix of love, mysticism, excitement, and adventure. *This book will be published on March 5, 2019, by Berkley with this new cover. 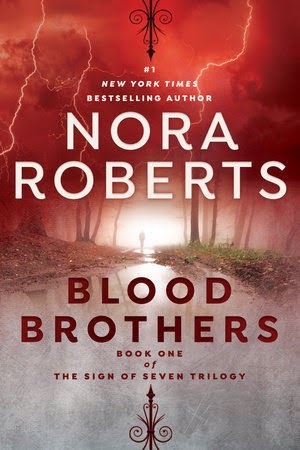 Nora Roberts, born in Silver Spring, Maryland, is the #1 New York Times bestselling author of more than 200 novels. During the now-famous blizzard, she pulled out a pencil and notebook and began to write. It was there that a career was born. Several manuscripts and rejections later, her first book, Irish Thoroughbred, was published by Silhouette in 1981. Having spent her life surrounded by men, Ms. Roberts has a fairly good view of the workings of the male mind, which is a constant delight to her readers. It was, she’s been quoted as saying, a choice between figuring men out or running away screaming. Nora is a member of several writers groups and has won countless awards from her colleagues and the publishing industry. Recently The New Yorker called her “America’s favorite novelist.” She is also the author of the bestselling futuristic suspense series written under the pen name J. D. Robb. There are more than 500 million copies of her books in print.